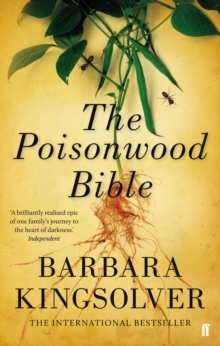 The Poisonwood Bible by Barbara Kingsolver was published in 1998 but although it's a very well-known and critically acclaimed novel, I'd never really thought to read it until a few weeks ago it was recommended by Marian Keyes on the Radio 4 books programme, A Good Read. The Poisonwood Bible is the story of five women, the wife and four daughters of a Nathan Price, an evangelical Southern Baptist minister from Georgia who in 1959 takes his family to what was then the Belgian Congo so he can carry out missionary work. As a family, they are hopelessly ill-prepared for the culture shock and hardships of life in a Congolese village, both physically and emotionally. The story begins with them packing 'all the wrong things' to take with them on their journey. Upon arrival, the painfully stubborn, dogmatic Nathan Price immediately sets about planting a vegetable garden which, thanks to his refusal to listen to their Congolese housekeeper's advice, fails. Their preconceived notions about race and religion are bigoted and patronising. And in the background, the Congolese struggle for independence, and all the accompanying interference from the West, rumbles on. Told from the five points of view of each woman - Nathan's wife Orleanna, 16-year-old Rachel, 14-year-old twins Leah and Adah and five-year-old Ruth May - The Poisonwood Bible has a fairly epic scope, spanning around 30 years, and yet each woman's story is deeply personal. Each narrator has her own distinctive voice, values and vision. The unashamedly selfish Rachel peppers her speech with unintentional malapropisms; her language, like her views on race and politics, is carelessly skewed. Adah, academically gifted but physically disabled by a brain injury at birth and possibly affected by some form of autism, is prone to reading things backwards and obsessed by palindromes and linguistic patterns. Language in general is important in the story: inflections are misunderstood, concepts are untranslatable, and translation becomes symbolic of the vast differences between the Prices' way of life and that of their new Congolese neighbours. Everything the Prices bring from America somehow fails to 'translate' when it reaches Africa, whether it's the powdered cake mix ruined by equatorial humidity, Nathan Price's uncompromising sermons that leave his congregation alienated and confused, or the family's preconceived notions about the Congo and its people. This is a long and sometimes rambling book, and the further the story progresses, the less deftly the (albeit fascinating) exploration of post-colonial African politics are woven into the narrative, and the particular voices and states of mind of the characters make some chapters a little hard-going in comparison to others. Overall, though, this is a beautifully written and absorbing novel with fascinating characters and I thoroughly enjoyed it.